Happy New Year to all our readers, customers and friends. We hope you and your family had a memorable holiday. We like to think of January as an exciting turning point - the old season is gone and the new sailing season is just ahead! Speaking of turning points, we are proud to announce another such happy moment. 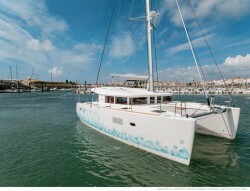 Tailor Made Yacht Charters has a new addition to our fleet.